A vacant house apparently breaks HVAC. About 18 months ago, the blower motor conked out, allowing the compressor to run for who knows how long. This time the thermostat got screwed up, running the heater for many hours. The heat was at 62, but the inside was probably 100 degrees before our house watcher discovered it. I dashed home and swapped in a new thermostat.I hope for the best! Looks like all our fishies survived. [CORRECTION: all three ghost shrimp and a Mickey Mouse fish died within 2 weeks. 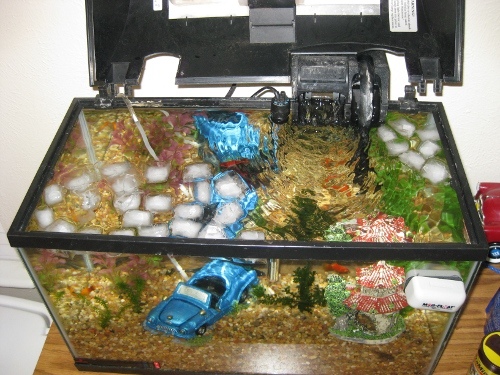 And the fish tank is now leaking.] I opened all windows in that room to introduce 32 degree air and threw a load of ice on top. After 20 minutes, the water temp was still 87, so I threw another load of ice. Doesn’t this look weird? I hate to think how much natural gas we churned through getting the house that hot on a 32 degree day. The new floor color is amazing. Posted on April 10, 2008 November 22, 2014 Categories HouseLeave a comment on All done! The den/living room ceiling is finished! Late week, it was taped, bedded, textured, and painted. Did you notice that the plastic sheeting is down? The room still has no attic insulation, so we’re keeping it mostly closed off from the rest of the house. But we can at least go into the garage without going into the front yard. All that’s left now is to sand and refinish the floors, install the blown in fiberglass attic insulation, and finish out the recessed lights. Oh, and replace most of our furniture. Argh. The drywall crew came out Wednesday morning and nailed up the ceiling! Next step is for the paint guy to do the tape, bed, and texture job. After that’s done, I can remove the plastic sheeting separating those rooms from the rest of the house! Posted on February 28, 2008 February 14, 2017 Categories HouseLeave a comment on Ceiling is wallboarded! You may notice the recessed lighting. We figured that since everything is apart anyway, we might as well get some recessed lights installed. We got 6 lights total, all of which will be in the den area of this joint den/dining room. The sheetrock should go up this week. Two Cat 5e cables that will terminate right by the TV, anticipating future data use around the TV. A Cat 5e terminating around the dining room table on the other side of the room. A Cat 5e terminating near the couch which faces the TV. A Cat 5e cable that terminates outside the front porch and garage outdoors, both for possible PoE-driven security cameras. The other end of these cables will terminate in a hallway closet. I will punch the ends of these tables in the den/dining room, but I’ll leave them exposed for now in the closet.